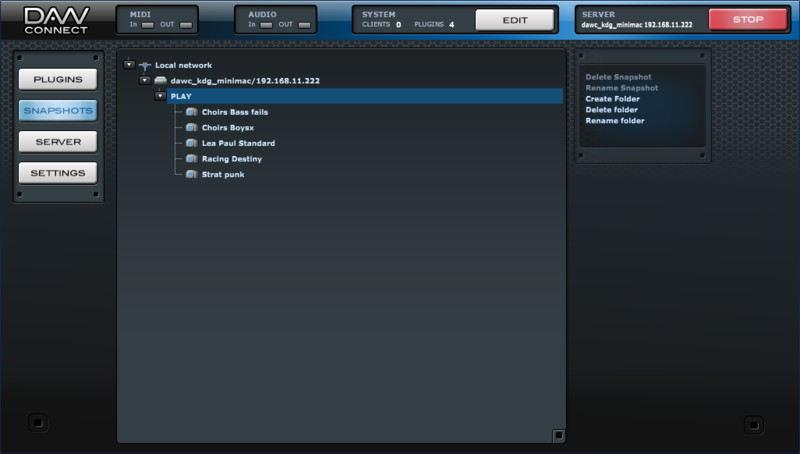 DAWconnect is a cross-platform software solution to share plug-ins (audio, midi and GUI) over a standard network connection. DAWconnects smart integration into your digital audio workstation not only lets you hear and play a remote plug-in, but also gives you access to its GUI. This is like having the remote plug-in installed directly on your DAW and does not differ from handling local plug-ins. If you are working with virtual instruments and sample libraries, you know how CPU and RAM demanding this can be. The main goal of DAWconnect is to add massive scalability to your DAW. Run additional plug-ins on separate machines and connect them to your DAW with just a network cable instead of additional hardware. DAWconnects future proof technology not only allows connecting machines on your local network. Steadily increasing internet bandwidth makes way for uncompressed audio transmissions with acceptable latency over the internet. DAWconnect is the first plug-in that allows you to connect to the DAWconnect Cloud Services to stream large sound libraries without downloads or installation. Distribute your plug-ins and libraries on different machines to expand you’re your CPU and RAM resources on hand. Use Windows plug-ins on a MAC and vice versa. Use 64Bit plug-ins in 32Bit DAWs and vice versa. 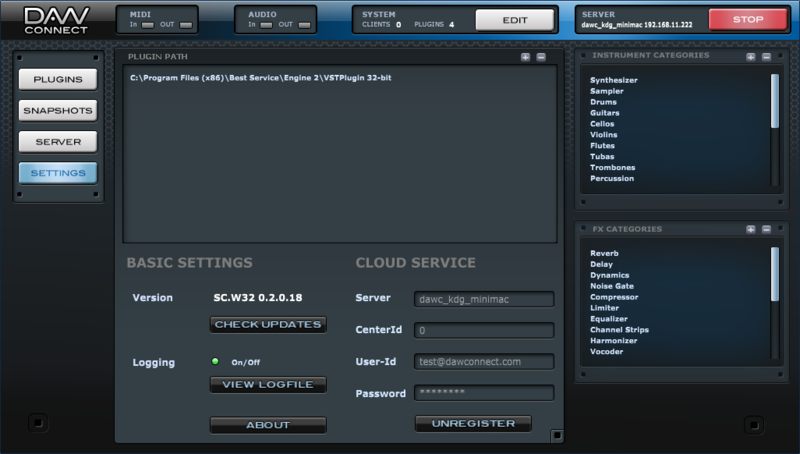 The DAWconnect plug-in is a standard VST/AU plug-in which either connects to a local DAWconnect Studio Server or to the DAWconnect Cloud Services. Please watch our tutorial video below showing how to access the DAWconnect Cloud Services. 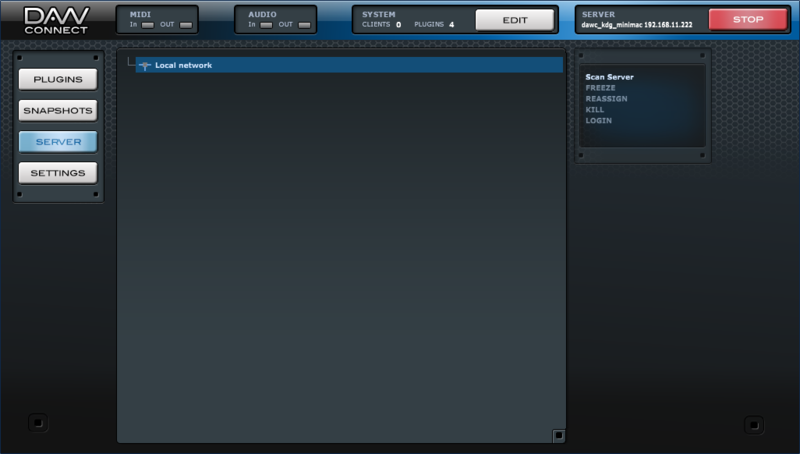 The DAWconnect Studio Server is intended to operate on your local network. Installed on a MAC or PC it hosts the plug-ins and libraries you want to deploy on your network. It can serve multiple clients and instruments but only one remote control (GUI) per server. The hardware requirements for the DAWconnect Studio Server are very low. So you can easily reactivate old machines. As long as the desired plug-in works on this machine, DAWconnect Studio Server can distribute it on your network. This also is an ideal solution, if you want to use your plug-ins from multiple edit suites with only one installation (please make sure to respect the EULA of the used instruments/libraries). Hosting a plug-in or library in the cloud is a revolutionary new way to deliver products to your customers. On the client side only a small software is required to access unlimited possibilities. On the provider/server side we can offer various business models. From demonstration purposes to "pay per use", the DAWconnect Cloud Services open a new and contemporary marketing and sales channel. We offer a simple SDK to integrate the DAWconnect Cloud Services into your website. Please contact us if you have interest in offering this great services to your customers.